Powermaster is our full range of HPUs. These robust HPUs reflect demanding needs on submerged intervention spreads. A wide range of variable displacement pumps and regulator options allow tight adaption to application specific requirements. power. All motors are 4-pole, 3phase AC operating at 60Hz. Operating voltages ranges from 1 kV to 3,3 kV. The units operate oil filled and compensated to ambient pressure. 6082T6. Fasteners, fittings and connectors are made from AISI316 stainless steel. The units are configured with internal PT 100 sensor for temperature measurement and water ingress sensor. Signal interface is by Burton 5506-2004 as standard. Power connection is by Burton 5536-3204 connector as standard. Oil filled hose can be provided as an option. The HPUs utilise the Parker™ PVplus series of pumps as standard. This provides an extensive flexibility in displacement options and control configurations throughout the entire range of HPUs. 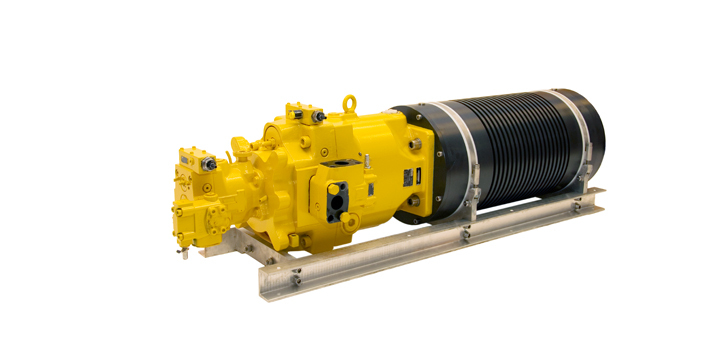 Single or dual pumps can be delivered in more than 50 different configurations. Regulator options cover remote differential pressure, load sense, cut off pressure regulators and power limiters in many combinations. The larger Innova PowerMaster units fit perfectly with Innova Thruster Master as the core of a propulsion system in intervention spreads. All models are configured with a separate base that allows skidding installation into vehicle or system. This provides orientation freedom to solve hydraulic line connection in tight environments such as ROVs. treatments, alternative voltages, connectors, special pumps/regulators, vertical mount etc.